Long before Uncle Spuzz (AKA Bruce Braun) was bestowed the honorable title as Uncle he was just your typical gregarious boy nicknamed Spuzz growing up in western, PA. He attended Valparaiso University located in Valparaiso, Indiana. Uncle Spuzz earned a journalism degree from Valpo and soon after graduation he traded his Hoosier state membership to begin a television broadcast career as a North Carolina Tar Heel. Jumping ahead a few more years, and by now officially crowned Uncle Spuzz, he began publishing several Duck 31 adventures for his nieces and nephew. What an amazing journey Duck 31 has traveled. 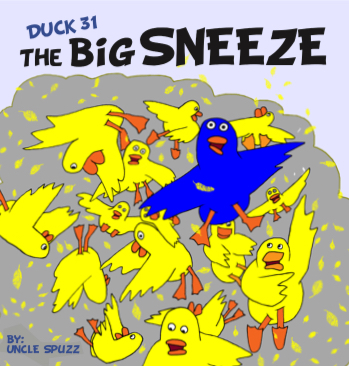 No longer just a family keepsake, Uncle Spuzz can’t wait to share the entire collection of Duck 31 adventures to his ever-expanding family of readers. After several years in broadcasting, an opportunity of a lifetime came knocking on Uncle Spuzz’s door. A private academy was recruiting elementary school teachers, so he leaped at the chance. Teaching second and third graders was quite a thrill and most definitely a dream come true for Uncle Spuzz. It was at this time in life that he began dreaming up children’s stories and characters that he routinely tested on his wide-eyed students.